NEW YORK – Officers from several agencies searched the headquarters of the Archdiocese of Galveston-Houston, Texas – led by the President of the United States Conference of Catholic Bishops (USCCB) Cardinal Daniel DiNardo – on Wednesday in an effort to collect evidence against a priest accused of sexual abuse. In a move that surprised diocesan officials, District Attorney of Montgomery County Brett Ligon obtained a search warrant at 8:30 a.m. on Wednesday morning and an hour later a team of 60 law enforcement agents descended upon the diocesan headquarters. The search warrant focused on the case of Father Manuel La Rosa-Lopez, who has been charged with four counts of indecency with a child involving sexual contact. La Rosa-Lopez was arrested in September. The alleged incidents, which include allegations from both a man and a woman, took place from 1998 to 2000. La Rosa-Lopez has denied the allegations and is currently free on a $225,000 bond. Wednesday’s search is the fourth warrant of Church facilities obtained by Ligon, including a local parish and a rehabilitation center. Along with representatives from the District Attorney’s office, the team included personnel from the Texas Department of Public Safety, the Texas Rangers, Conroe Police Department, and federal agents. Ligon said that while his team was prepared for the search to take two full days, he said that due to the cooperation they are receiving, he expected the task could be completed within the day. While stating that Cardinal DiNardo had cooperated, Ligon hinted that there may be others throughout the diocese who have prevented law enforcement officers from getting the information they were seeking. 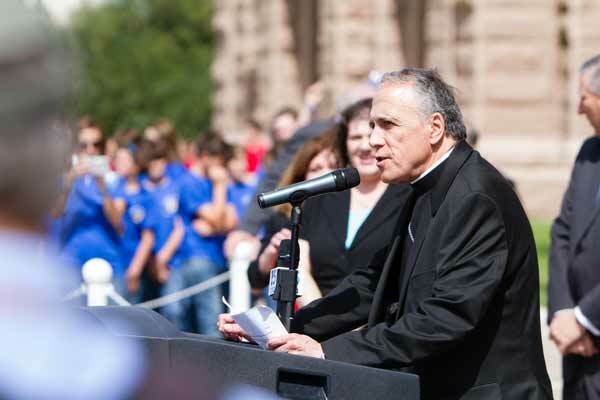 “If Cardinal DiNardo is cooperative, it doesn’t mean that people that work with Cardinal DiNardo are cooperative. It doesn’t mean that they’re going to tell him the truth,” he said. “The good thing is, I’ve taken the burden off of everybody in the Catholic Church. They don’t have to know anything. I’m going to find it all out,” he challenged. The district attorney said this includes any files in the archdiocese’s secret archives. “In fact, consistent with Cardinal DiNardo’s pledge of full cooperation, the information being sought was already being compiled,” the statement continued. Speaking to reporters as the search was underway, the prosecutor said he was willing to follow the evidence wherever it leads him.